Norfolk Terriers have small, hardy and thick frames covered in medium-length, wiry coats that come in red, wheaten, grizzle and black & tan. Their slightly rounded heads have wedge-shaped muzzles, dark eyes and V-shaped ears that drop forward. They have sturdy necks, short backs, strong little legs and medium-length tails that are carried high. Overall, Norfolk Terriers have a resilient but agreeable look. 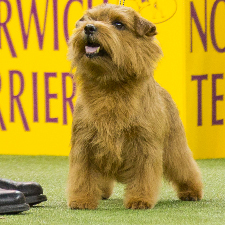 One of the smallest working terriers, the Norfolk Terrier is bold, alert and sociable. Around the home, it is affectionate and even-tempered, adaptable to just about any living situation. Norfolk Terriers can become very attached to their owners. Norfolk Terriers are easy to train, but they really respond to a strong-willed teacher who keeps the commands clear and positive. They crave companionship and togetherness. Left alone for too long, whether indoors or in the yard, they can become bored, restless and destructive. Norfolk Terriers can live as long as 14 years with few genetic health problems. They require very little grooming, but a daily brushing is recommended. Bathe only when necessary, since soap can remove the Norfolk Terrier’s weather-proofing. In the early part of the 20th century, breeders in eastern England developed a small rat-catching, fox-chasing terrier called the Norwich Terrier. For several decades, this diverse breed featured both hanging ears and pricked ears, not to mention a variety of colors and coats. In 1964, the English Kennel Club categorized the hanging ear variety as the Norfolk Terrier.